Yuba, or soy milk skin, is essentially the film that forms on top of moderately heated soy milk. It’s akin to the skin that forms on unstirred boiled milk, only a little less gross and a lot more tasty. You can buy yuba packaged in stores, but the rich flavour found in a fresh batch is completely lost. I recommend the store bought stuff for almost any recipe just because it’s twenty thousand billion trillion percent easier, but I think it’s important to understand how something is made, and as a snack on its own fresh yuba is worth the effort. First you will want to make a rich batch of fresh soy milk. Soak 1/2 cup of dried soy beans in two cups of water overnight. In the morning blend the water and beans to a pulp in a liquidiser/blender and pour into a medium saucepan to heat. Swish an extra 1/2 cup of water around the blender to pick up any bits that didn’t make it into the pan and pour it in. Heat on medium high until the mixture starts to rise. Immediately turn the heat to medium low and heat for around ten more minutes, or until the gross beany smell is gone and it begins to smell sweet. Line a mesh strainer with a piece of fine muslin and place it over a large bowl. Pour the contents of the pan into the strainer and mix it around a bit to allow some of the soy milk to seep through. Add 1/2 cup of boiling water into the pulp and stir it through. Rather than burn my hand off, I tend to leave it for 10-15 minutes before wringing the muslin to extract the soy milk, but the general idea is just get the liquid out. As much as you can. You should be left with about 2 cups of soy milk in the end, give or take. Be sure to save the now strained soy pulp inside (okara!) because you can use it for lots of other things. 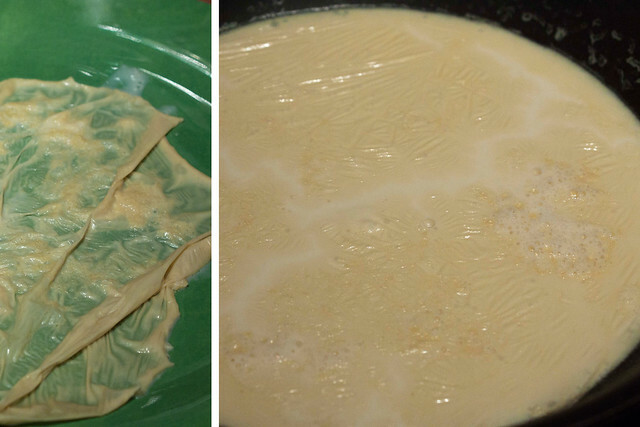 Pour the soy milk into a shallow frying pan and put the heat on low. Super low. As in no bubbles, no potential for boiling. After 5-10 minutes you will see a skin form (try lightly blowing on the surface of the milk and you will definitely start to see it after a few minutes). Once a solid skin has formed across the surface of the milk, carefully cut around the edges or stab them down with a chopstick so you can remove the sheet from the pan. I would like to give advice on how to do this cleanly, but basically I just fling soy milk across the kitchen and eat the yuba straight out of the pan with chopsticks (with a tiny bit of soy sauce or kecap manis is my favourite). Each time you pull a sheet off the top a new one will begin to form, so the yield is dependent on the size of the pan you’re using and how much soy milk is in there. Even if you’ve only got the patience for one sheet, give it a try. You can always store the rest of the soy milk for a rainy day. Or coffee. I never heard about Yuba! I know what you mean about knowing how to do things, I love that too. I might try to do this next time I make soymilk. I’m impressed, I’ve been wanting to give this a go for a while now, your post has eased the trepidation. You’re awesome! I wish I had the patience for stuff like this! You should come to my house & make me some Yubamaki a la Pompoko! I went tearing through store after store in Chinatown looking for yuba (was making vegan haggis & needed an appropriate skin) and finally found it in humongous sheets that are now taking residence in my freezer. Would have been much better, it seems, had I found this recipe first. Thanks for posting it. My next yuba adventure will be attempting mock fish, and fresh yuba will probably yeild better results.